Eli Whitney en Usona Poŝtmarko de 1940, 1c. Eli Whitney (8a de Decembro, 1765 – 8a de Januaro, 1825) estis usona inventisto plej bone konata ĉar inventis la kotonseparilon. Tiu estis unu el la ŝlosilaj inventoj de la Industria Revolucio kaj de la ekonomio de la antaŭmilita Suda Usono.</ref> La inventaĵo de Whitney konvertis la malgrandan kotonproduktadon en profitega produktado, kiu plifortigis la ekonomian fondon de la sklaveco en Usono. Spite la socian kaj ekonomiaj efikon de lia invento, Whitney perdis multajn profitojn en juraj bataloj pri patentoj por la kotonseparilo. Tiele, li turnis atenton al sekurigo de kontraktoj kun la registaro en la fabrikado de pafiloj por la ĵus formita Armeo de Usono. Li plue fabrikis armilojn kaj inventis ĝis sia morto en 1825. ↑ "Elms and Magnolias: The 18th century". Manuscripts and Archives, Yale University Library. 16a de Aŭgusto, 1996. Alirita la 19an de Marto, 2008. Dexter, Franklin B. (1911). 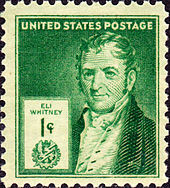 "Eli Whitney." Yale Biographies and Annals, 1792–1805. New York, NY: Henry Holt & Company. Hall, Karyl Lee Kibler, & Cooper, Carolyn. (1984). Windows on the Works: Industry on the Eli Whitney Site, 1798–1979. ILES, George. (1912) Leading American Inventors. Henry Holt and Company, p. 75–103. McL. Green, Constance – Edited by Oscar Handlin. (1956). Eli Whitney & The Birth of American Technology. Library of American Biography series. Roe, Joseph Wickham (1916), English and American Tool Builders, New Haven, Connecticut: Yale University Press, https://books.google.com/books?id=X-EJAAAAIAAJ&printsec=titlepage . Represita de McGraw-Hill, New York and London, 1926 (LCCN 27024075); kaj de Lindsay Publications, Inc., Bradley, Illinois, (ISBN 978-0-917914-73-7). Ĉi tiu paĝo estis lastafoje redaktita je 14:25, 22 mar. 2019.